Here we are in the third week of August, and the digital download version of Ghost Notes the Audio Book is still nowhere to be found! CDBaby seems to be having some trouble, but they've communicated nothing to me, so I wouldn't know. I'll keep trying. Until then, you can always order a burned copy here. I now publish the content of this blog at five places. And my MySpace bulletin board. I also try to remember to post a blog reminder at my Twitter account, but this habit hasn't sunk in yet. Please follow me there, if you like. It will help keep me honest. I seem to get readers at each of these locations, so if it's easier to keep up with my law layin' in one of these other ways, please do so. While my blog is the same at all of these locations, my Facebook "note" seems to get the most attention. I'm not sure why that is. Facebook seems to be experiencing its peak as a social networking device, as a piece of our society. It's kind of weird how popular it is. Its appeal reaches across boundaries. Most everyone wants to be a part of it. Back in 1994, when I first got hooked up, what most stunned me about the Internet was that everyone was interested in this new way of communicating, but no one was communicating in a new way. On the Internet you could get the same stuff you could get in newspapers or in books or in letters from your friends and family or on CB radios, but so what? What truly new way of thinking or communicating was going to evolve out of this new technology? Something revolutionary, right? I wonder if Facebook is the latest, newest way to communicate, taking us one step out of the Internet's dark ages and giving nascent form to how we talk when we talk on the web. Combining text and images and links in an easy-to-understand interface, posting news and videos and the like, sending our thoughts only to those we know and approve of, is this the beginning of what our Internet lives will look like for a while? Forever? 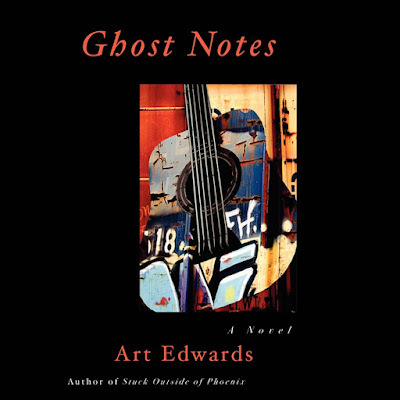 Here we are in the second week of August, and the digital download version of Ghost Notes the Audio Book is still nowhere to be found! Rest assured I'm working on it. You can always order a burned copy here. 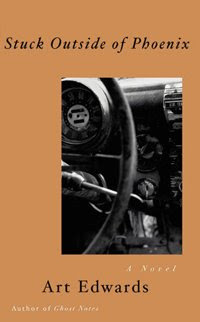 A few weeks ago, I gave a few chapters of my third novel, Badge, or Good Night to the Rock 'n' Roll Era, to some friends. I wanted to get feedback on how I was doing, and if it was coming across like I thought it was. I figured I'd get some praise, and some criticism, and I'd fix the problems and get this thing out to agents right afterward. I was thinking November, maybe February if things really looked bad. Well, my friends are my friends, but that didn't keep them from letting me have it. Let me tell you a bit about my writing process: I write many drafts of my novels. It's hard to count how many, but you can bet I go through the thing at least five times before anyone sees it. When is it time to show others? When I've sculpted the thing into the best statue I know how to make and I can't make it any better on my own. I usually fool myself into thinking it's close to done at this point. My friends searched out the book's imperfections like demonic therapists, managed to find a couple of elements of the novel that weren't spot-on and dragged them into the light of day, forcing me to deal with them. Painful as this may be, the good news is that they had excellent suggestions for revision. They poked holes in my balloon but suggested ways to seal it so it can't be punctured again. Despite the requisite pouting that comes right after such criticism, this is one of the highlights of the novel writing experience. You plug away by yourself for years at the thing, never quite satisfying that little voice inside of you that says something isn't quite right. That's when astute readers can come in and solve a problem for you. It's almost like cheating. Of course, after you get the suggestion, you actually have to do the work, which is a whole different matter. Despite this setback, I'll get at the revisions, and I still hope to start submitting the novel in November. Which year, I don't know, but I feel strongly it will be in November.